Within Records make a welcome return..this time under Within Records EXP sub label. 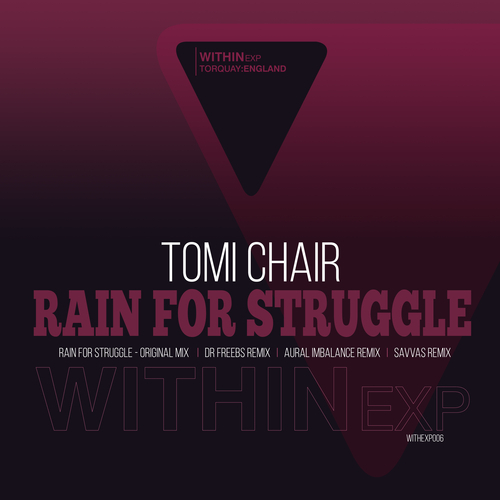 For this release we welcome our good friend and talented producer Tokyo based Tomi Chair (Tominori Hosoya) with his blissfully Nostalgic production "Rain for struggle" a poignant Deep/Progressive House track that builds to a sun lit crescendo of dreamy synths and breathless vocals. Dr Freebs revisits the track this time bringing a dubby electro downtempo balearic hybrid of a remix. Aural Imbalance returns with his signature AI Deep trip Remix bringing the lush spaced out atmospherics into the mix for pure blissed out sonics. Finaly Detroit born Greek based artist Savvas come back to us with his deep house remix with an organic touch and warm acid bass lines completing this welcome return with Summer vibes all over ! Tomi Chair (Tominori Hosoya) is a music producer and dj from Tokyo, Japan. His trademark sound is big, wide, spacey, and melodic, with intricate melodies and quality production techniques. Through his experiences as a nightclub dj, he became influenced by progressive sounds, whether house, techno, trance or breaks. This led him to try his hands at producing, and in 2008 he debuted on the global dance scene, receiving mass appeal amongst dj's and underground audiences around the world. Today he enjoys a dedicated fanbase consisting of clubbers who love losing themselves to his melodies, and the labels and dj's who love buying and releasing his tunes.